On the subject of the greatest 100 novels written in English the 20th Century, I was momentarily smug when I realized that I'd read 75 of the group compiled by the folks at Modern Library. But appreciated the misgivings of reader factions who felt that their groups, their "voices" had been ignored, shunted to the side, 'marginalized" , with the editors making inadequate efforts to broaden the Canon. But the real use of such list, I think, is to start a controversy, to get a debate going about what makes a good novel, and, I suppose, to have at least part of the public sphere be about something other than whether a sitting president did the wild thing with an intern in a broom closet just off the White House pantry. Not least of all, I've had more conversations, well-mannered debates (!) as to what constitutes a great novel, and most of these chats have gone a step further and dealt with, oddly, why literature is important to a society and culture such as ours. The talks have been stimulating, and, since I work in a bookstore, sales of novels have been brisk, and this due to a high-flying list that pleased no one. Let's have more, and let's rescue literature from the academics, who've abandoned any certainty in their analysis. For the greatest novel written in America in the second half of the 20th Century, I vote for "Underworld" by Don DeLillo.No one writes better prose than he does, and the scope of this novel, comprising a hidden history of America in the second half of the century, races past Pynchon and Gaddis and Mailer and Oates, all writers deserving of Nobles. DeLillo's efforts to show America as a multi-platformed myth is grand and achieves a sustained poetics. DeLillo's plotlines mirror a sense of America itself, being less a collection of lines that meet to some predetermined point where greatness is conferred at the completion of heroic tasks, but rather than as mass of intersections that criss-cross one another, each with a version of the story told in a personalized language that stems from a world that is complete unto itself, a race of voices and noise that is a churning vat whose parts won't meld. Nice work, great work, magic. It's never occurred to me not to consider DeLillo a postmodern writer, since his work, especially Great Jones Street, the Names White Noise and especially the hugely brilliant Underworld has outlined and defined the postmodern terrain and its most compelling attributes. As discussed earlier in this thread and in other threads where DeLillo figured largely to the subject at hand, his world is about characters trying to adjust to and survive within a universe filled with Invisible but Irresistible movements that threaten to finally take them in. DeLillo is often critiqued by some readers and critics (perhaps weary of his name being intoned when the subject of greatness arises in their conversations) for writing characters who all sound alike, unnatural, distinct from real life. I would hope so. "Natural" ought to mean an idiom that's believable for narrators and characters to be speaking in, an idiom whose success depends on how well the author constructs the fictional world they're entertaining us with. 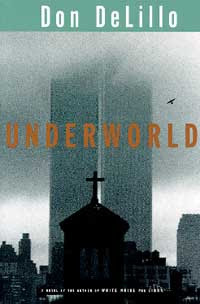 Underworld has several idioms that DeLillo plays with well-- an awful lot of this novel takes its narrative energy from the minds of characters who are thinking their way through their predicaments, a perfect and virtuoso blend of Faulkner association and Italian American cadences -- so it's a matter of vernaculars, plural, that makes up the weave up the novel. But the DeLillo "voice" -- detached, musing, aware of some melancholic finality at the end of the storylines that belie the rationalizations and worldviews of the characters--the artists, the ballplayers, the trash disposal capitalists, the nun-- that winds up in an endless chain of ironies. It's a tone of expression that seems quite right for DeLillo: natural, in other words. What makes it into a style is his ability to modify, alter, or disguise it's timbre, pitch, and density so that he seems to create a universe that seems completely and desperately besotted by a whispering anxiety of aimlessness. The usual voice flows quite well, smoothly in fact; it's not for nothing that DeLillo is praised for writing the best sentences in American English. I don't hear any of Mamet's style in DeLillo. Not a trace. Faulkner, perhaps, especially noticeable in Underworld, but nothing from Mamet, whose rhythms are those of a dropped bag of hammers. We end up with novels dealing with specialization seen not as a way to understand how the world and history work but rather as delusional and distracting activities that keep us as consumers. It is a body of work where what we say about the world we live in is deflected and abstracted, absorbed into larger things that are beyond our antennae. Whether the tales are about a rock artist who has millions hinging on his every lyric, a professor of Hitler studies finding himself powerless, despite his special knowledge, in light of an unexplained catastrophe, or about a risk-management assessor analyzing local political situations to minimize the the chance of ruin for potential corporate investment, DeLillo's' work wonderfully imagines the existence after modernism's' promise of better living through constant, violent change has turned into a documented set of fiascoes, disasters, wars, and genocides. DeLillo's work, it seems, will survive the withering dismissals of affected yokels, and "great American novels" continue to be produced yearly, quite despite our obsession to narrowing the field to only a handful of worthies who fulfill criteria no can state for sure. But DeLillo stands poised for world-greatness because he brings Americans into the larger world, where qualities of being American, imagined by our civics teachers as being divinely granted, has no bearings in a world that seems incoherent and supremely foreign. DeLillo's work, in "The Names", "Mao II", "Players", have Americans of a sort--professionals, artists, intellectuals, poets, usually white, privileged--losing themselves amid the shifting and renegotiated narratives, collective and personal, that are repeated, all mantras, to give the world a sense of reason and purpose beyond the hurly-burly of the phenomenal world. This is a sphere where the sense of the world, our strategies, and accounts to deal with it, are fed to media and then sold back to us with conditions attached. I imagine a work that is equal parts Henry James, for the aspect of Americans confronting the non-American world, and Orwell's "Animal Farm", where we have the pigs, in the dead of night, with ladder and paintbrush, changing the wording on the social contract painted on the side of the barn. DeLillo, as well, deals with Americans in America, thankfully, and masterstrokes like "White Noise", "Great Jones Street" (an amazing rock and roll novel whose hero could be Dylan, Bowie, or Cobain), and ultimately "Underworld" sift through the loss ourselves in our own country. Our stories are modified and changed; our Gods change their minds about ultimate truths as technology forces more secrets and in-compressibility upon us. "Underworld" is a tour where history is not just forgotten, is not just pushed to the margins in favor or a Grand Narrative, but is in fact disposed of, thrown away when the metaphysical argument no longer suits the immediate need. The search for the baseball is analogous to a journey back to some Eden that never existed. No one maintains topicality alone makes for greatness. Great style twined with keen insight makes the argument for great riches more convincing. A flair for the poetic, a grasp of imagery that enlarges one's sensibility in the world settles the issue. DeLillo, to my perhaps exclusionist sensibilities, has all these elements. But topicality is not what DeLillo is about; the currency of his plots is believable starting points for his investigations into the nature of our language, of how we address ourselves. His books, I think, have enough for generations of readers and critics to study and discuss for decades to come. He writes broadly enough, and well enough, to sidestep victimhood as a consideration and force readers, and critics for that matter, to study the performance of literature, the literary act itself. I am an obvious DeLillo partisan, but I don't think everything he's done is fully rendered, satisfying every idiosyncratic standard a "serious" reader might contrive, but the fact is that DeLillo is not a novel-a-year contestant with Updike or Joyce Carol Oates, or recently, Mailer, all of whom seem in a rush to consolidate reputations and make themselves nice and shiny for Nobel consideration. DeLillo has published a mere 11 novels since 1969, hardly an overload for almost thirty years as a professional writer. That he has themes that re-emerge from work to work is to be expected from a writer, and for DeLillo, his investigations into what we too- easily refer to as post-modernism (yes, I am guilty as charged) and it's accompanying paranoia have produced major fiction, which is about, in too-broad a summary of his work, the difficulty of living in a world that has been stripped of any resonance of meaning, any suggestion of Truth, capital "t". This is a kind man-made environment that stems from the make-it-new innovations of High Modernism, and entering the next century with a sense that we have not learned anything despite high-speed technologies that shoot raw and indigestible mounds of data from one place to another.